CE Certified , Maximum Breaking Strength: 23KN.Will fit: waist 31.49"(80cm) to 55.11"(140cm) ; Leg 23.62"(60cm) to 29.53"(75cm)，Strap Width:17.72in(45cm). 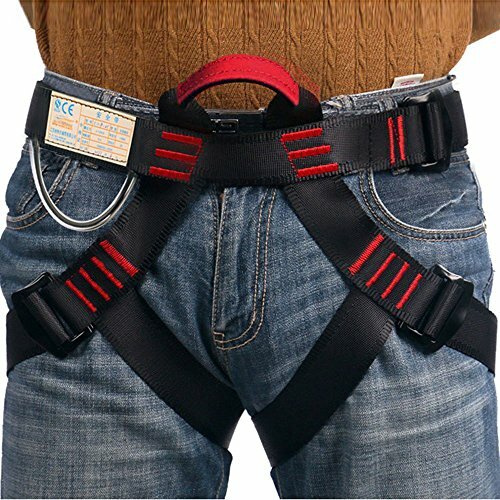 Perfecting for Fall Arrest,Scaffold,High Work,Fall Protection Hardware,high-intensity environment,outdoor climbing activities, wilderness survival outdoor activities, floor escape,outdoor adventure activities. mountaineering, ice climbing, outward band,fire rescue,working on the higher level,caving,anchoring as well as aspects of disaster relief and so on.